I've fallen off the wagon of consistent blogging because I've been feeling very 'meh' about all of my content lately. It doesn't matter how much I tell myself to just focus on what I'm doing, I'm my own competition - I'm competing with myself (in the words of queen Cardi B!) I just can't help but compare what I'm doing to what everyone else is doing. And so I've had to take myself away from social media a lot these past few weeks to simply focus on myself and what I want. I don't want to just give up on something I love, I simply want to get back to enjoying this. I want to scroll through my feeds and feel inspired, not jealous; I want to uplift others and the great things that they're doing; I want to put out content that I'm truly happy with and not care if other people are interacting with it or not. The first in this series actually went up earlier this month (and it's a post that I'm really rather proud of! ), so if you've read it you'll already know my intentions. But basically, I've done posts before on both fast fashion and going cruelty-free and I want to share more of my ~journey in doing better for the environment. Introducing sustainable fashion brands; talking about my favourite cruelty-free picks and just sharing ways in which I'm trying to do better (i.e. cutting down on single use plastics). I'm hoping to incorporate this more into my instagram stories too, with mini hauls and new discoveries so make sure you're following me. I think a lot of me feeling down about my content comes from the fact that it all became very stagnant and very samey. I wasn't trying new things, I wasn't pushing myself and I got bored. I found an editing style that worked for my photos and stuck with it; there was nothing wrong with my blog design so I wasn't looking to change it. But now I'm trying new things! I tested this a bit in both this post and my last one, with a few different photo styles and a layout with a little more to it than usual, but I want to do MORE. I've redesigned my blog header and social buttons, just small changes that made it feel fresh before I find a new theme that I like, and I'm mixing up my instagram with different editing and focusing on adding a lot more colour. I'm enjoying what I do again and that's all I can ask for! - I've been wearing all of the rainbow print and am just living for the colours. 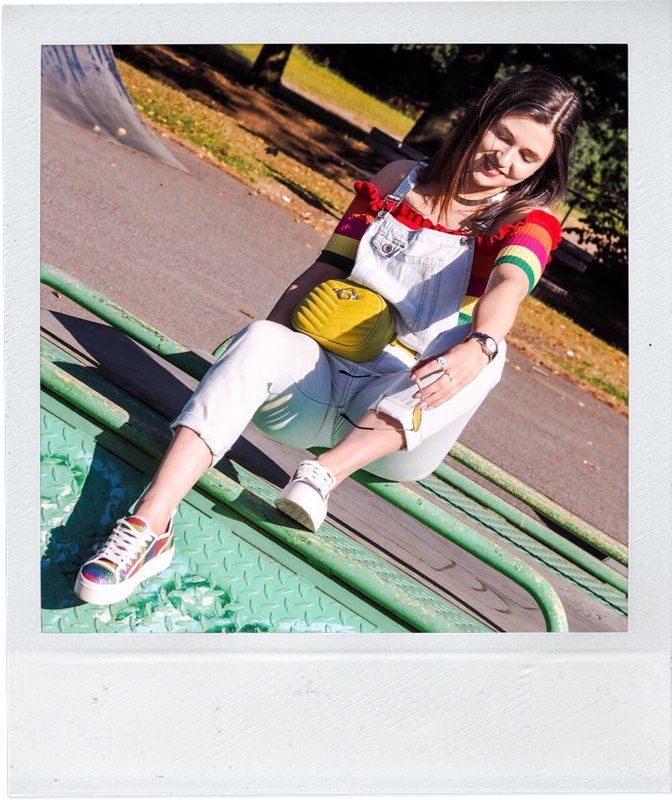 If you follow me on instagram you'll have seen my rainbow tops, cardigan, trainers and probably be sick of it but I'm not, so, soz! - I went into Trinity Kitchen in Leeds to see the new stalls for the summer switch-up and am now obsessed with the Thai Khrim stand. It's ice cream done fresh in front of you on a freezing block, where they mix in flavours of your choice and spread it into rolls in a tub before adding toppings. I'm terrible at explaining and I'm also supposed to be dairy free but shh, just check it out if you're local! - I finally got on board the Queer Eye hype and OH MY GOD why did it take me so long?! I'm fully in love with all of them and have definitely balled my eyes out at more than one episode. - A random one; but I finally conquered my fear of driving into the centre of Leeds and now I don't know why it took me so long? 10x easier than getting the train. Next stop: motorway driving. - After months of persisting, I have eventually finished reading The Handmaids Tale. I'm not sure why it took me so long tbh; a combination of it being heavy and the jumping between current and past being confusing if you only get to read a chapter at a time on your lunch break. Anyway, now I guess I have to watch the series? 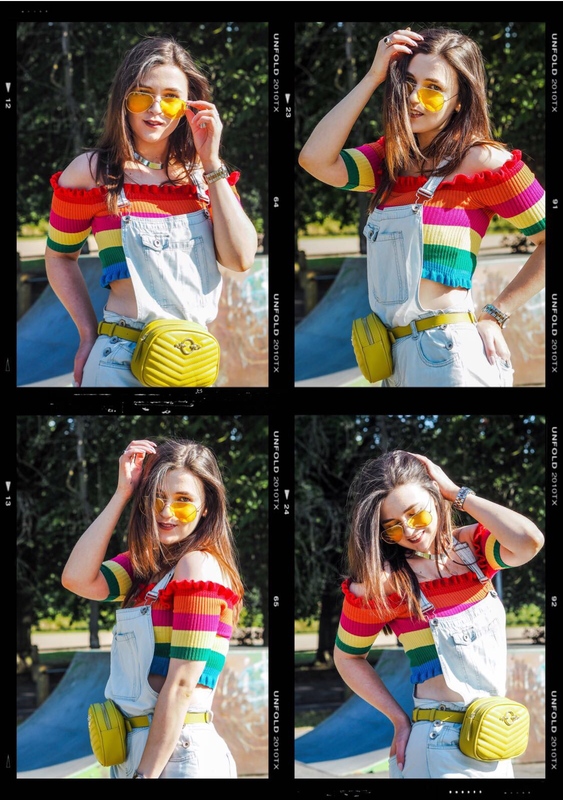 In honour of my newfound love for all things rainbow in my wardrobe and the fact that June was Pride month, I thought I'd wear a couple rainbow things for this post AND share some of my favourite pieces with you below. As for what I'm wearing, you can find the top here and the trainers here (both in the sale so be quick!). 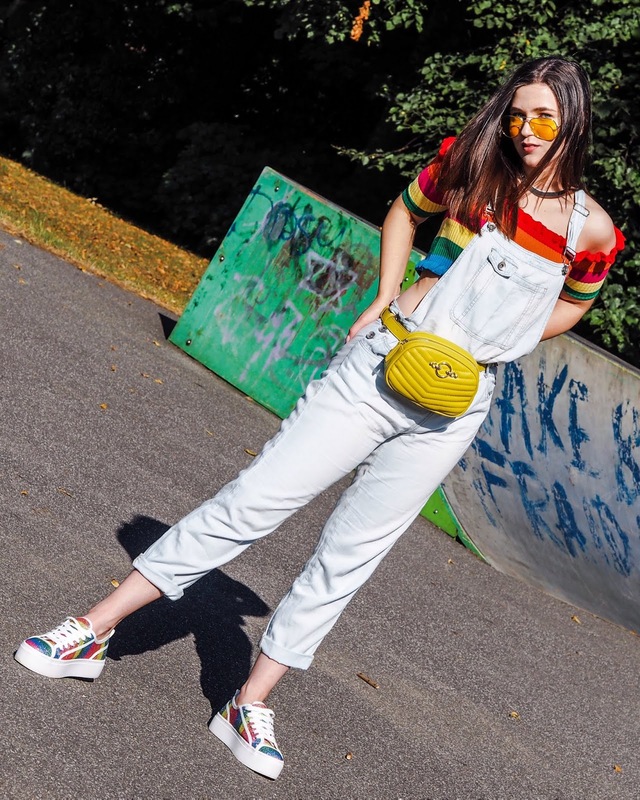 The dungarees are one of those random gems that you sometimes find in Primark and have been going strong for about 5 years now. So lightweight and perfect for summer! Oh, not forgetting the bumbag and sunglasses!